TMS Software has released a new version of their TMS Cloud Pack for Firemonkey in Delphi 10 Seattle. TMS Cloud Pack is a huge collection of components which give you easy access to hordes of cloud services. There is everything here from Dropbox to Facebook to Youtube to Flickr. You should be able to use these components cross platform on Android, IOS, OSX, and Windows. In this new version there are some new components which give you access to Trello, Stripe, Google Sheets, GMail, and Google Analytics. The Facebook API component has been upgraded to support v2.4 and the Dropbox API component now supports OAuth2. The FourSquare API component has been improved and so has JSON parsing overall. We’ve covered this suite before here, here, and here. This is a commercial component suite but there is so much value here it is one of those must have component sets if you are working with cloud services. The time savings to be able to just plug into all these APIs is unbelievable. A free trial of the components is also available. You should be able to use these components with Appmethod (and probably C++Builder) as well. 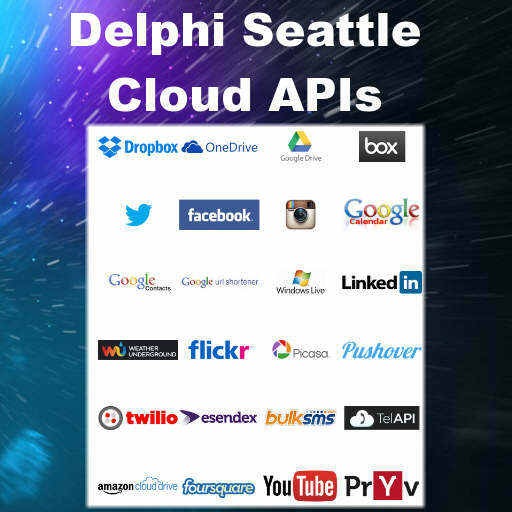 Head over and check out the all new TMS Cloud Pack for Firemonkey in Delphi 10 Seattle.